Time to think pink! Our community is our home and you can help by donating when you see the pink bags. 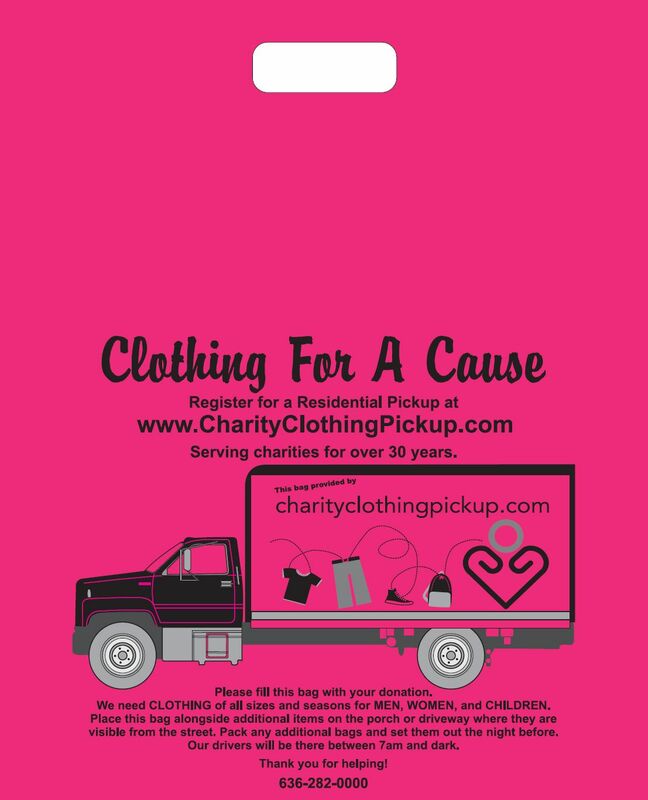 Charity Clothing Pickup is partnering with the American Red Cross to sponser a summer program for students from St. Louis city. The pink bags will be placed throughout the neighborhood on residents' doors for the summer season. This summer program is part of a four year project designed to help kids learn about money and time management. Advisor Kelly Kozlen offers the students assistance in setting up savings accounts for their paychecks. Because most of the students' families do not have the funds to contribute to put their money towards a college savings account. The students take pride in earning and saving their own money for their education. For the summer program, advisor Kelly Kozlen provides daily transporation from the participants' homes to location. The students wear pink shirts to coordinate with the pink bags. Your generosity helps support hardworking students achieve their goals and aspirations for a better future. Each student is determined to succeed and together we can help them build a stronger community. 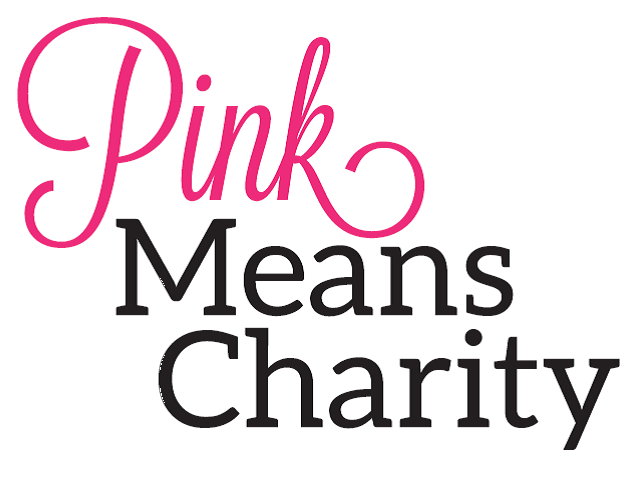 Helping is easy-simply fill the pink bag with clothing donations for men, women, and children. Clothing of all sizes and seasons is needed. After the bag is filled, place the bag on the porch or driveway the night before pickup. Drivers will arrive between am and dark. Please make sure the bag is visible from the street to ensure the drivers collect your generous donations. Summer program advisor Kelly Kozlen teaches sixth grade at Monroe Elementary. She earned her Master's Degree in Education Technology (Master's of Arts in Teaching) at Webster University 2003. At Monroe, she is in charge of student council, the talent show, school store, fight free, student of the month, digital yearbook, and perfect attendance. Kelly Kozlen loves teaching and believes: "I have high learning and life expectations for all children-no less than for my own life." Marcus Burse graduated Afton High School with a 3.3 GPA, honor roll, and perfect attendance. Marcus is a scholar athlete who exudes a quiet pride in his athletic accomplishments. He competed in All State, District, and Conference Honors Football as well as All Conference and District Honors Basketball. Additionally, he is a State Qualifier for 110m hurdles, high jump, & 4X1 Relays Track & Field. Marcus will be attending Truman State University with a football scholarship where he plans on majoring in biology. His goal is to be a high school biology teacher as well as a coach. Marcus wishes to instruct other student athletes by emulating the inspirational coaches in his own life. DeVontae Burse is a high school junior at Afton High School. He is on the honor roll with a 3.3 GPA and has perfect attendance. DeVontae is active in school activities such as student council and athletics. DeVontae, Marcus' brother, shares his brother's passion for education and school activities. He is a tri-sport athlete in football, basketball, and track & field as well as team captain. 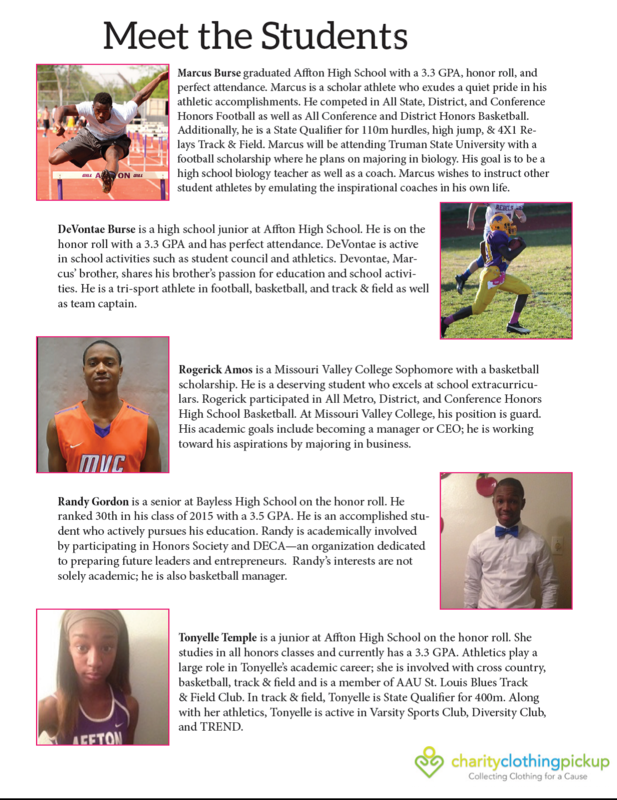 Rogerick Amos is a Missouri Valley College Sophomore with a basketball scholarship. He is a deserving student who excels at school extracurriculars. Rogerick participated in All Metro, District, and Conference Honors High School Basketball. At Missouri Valley College, his position is guard. His academic goals include becoming a manager or CEO; he is working toward his aspirations by majoring in business. Randy Gordon is a senior at Bayless High School on the honor roll. He ranked 30th in his class of 2015 with a 3.5 GPA. He is an accomplished student who actively pursues his education. Randy is academically involved by participating in Honors Society and DECA-an organization dedicated to preparing future leaders and entrepreneurs. Randy's interests are not solely academic; he is also basketball manager. Tonyelle Temple is a junior at Afton High School on the honor roll. She studies in all honors classes and currently has a 3.3 GPA. Athletics play a large role in Tonyelle's academic career; she is involved with cross country, basketball, track & field and is a member of AAU St. Louis Blues Track & Field Club. In track & field, Tonyelle is State Qualifier for 400m. Along with her athletics, Tonyelle is active in Varsity Sports Club, Diversity Club, and TREND.